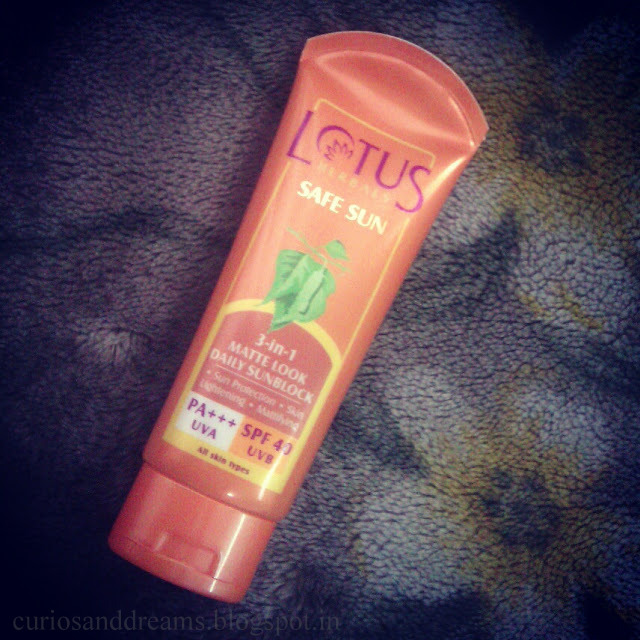 Lotus Herbals safe sun 3-in-1 Matte Look Daily Sunblock SPF 40 (PA+++ UVA and UVB) is so far the best suncreen I have tried. (Lakme, Aroma Magic and VLCC being the others. And I didn't like them at all..heavy and oily like grease). I did love my Fab India one, but recently it had started to make my face feel a bit greasy, and I was so uncomfortable with the feeling that I stopped using it altogether. And as a result I have a few sun spots now on my face, but I'm using it on my limbs. What it claims: Safe sun 3 in 1 daily sunblock is a revolutionary sun protection formulation which combines broad spectrum UVA/UGH protection with skin lightening ingredients to give a uniform matte finish to the skin. It's fast absorption and non-greasy formula ensures a shine free, light and clean feel. Directions: Apply sunblock liberally and evenly on face and exposed parts of the body (neck, arms, legs etc) before exposure to sun. Re-apply frequently. Ingredients: Water, Kaolin light, Glycerine, Polyacrylamide C13-14, Isoparaffin Laureth-7, Oxybenzone, Octyl Methoxy cinnamate, Titanium dioxide, Butyl methoxydibenzoylmethane, Isopropyl Myristare, Cyclopentasiloxane, Elcosene copolymer, Birch extract, Fumed silica, 2-phenoxyethanol, Methylparaben, Propylparben, Methylcholrolsothiazolinone, Methylisothiazolinone, Red iron oxide, Yellow iron oxide & fragrance. PHEW! I have a headache now..look at that list! (Why do they claim to be all herbal, I do not understand. I have no idea what all those scary names mean and I have no intention of Googling them either. As long as the product suits me..I am okay with it). The product comes in a plastic tube with a flip cap. It is leak proof and travel friendly. The only problem is that the lotion gets accumulated a bit at the opening and dries up.. so be careful and wipe it after every use. 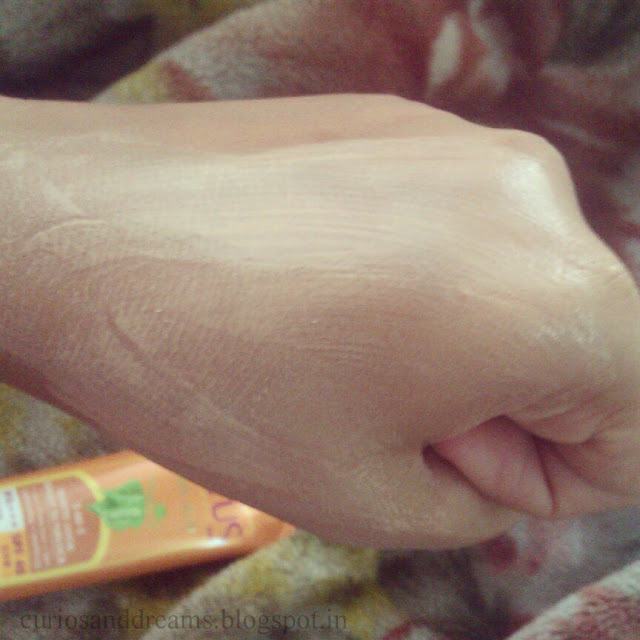 It is a water based light lotion that spreads easily. No need for working in the product for a long time. And no white cast! Hurray! Slightly tinted. Now, it won't give any coverage, but yes it will even out your skin a bit. The fragrance is pleasant and I quite like it. Nothing overpowering. But if you like your products to be fragrance free, then do smell this once before buying. It keeps my face oil free for 5-6 hours easily. After which if I am out, I reapply it. 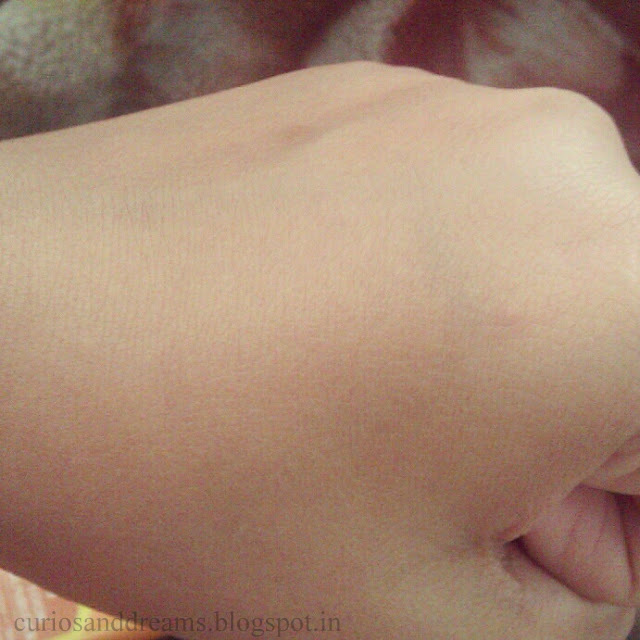 I havent noticed the skin lightening claim so far, but it gives a lil brightness after application. I think its because of the tint. (Its alright though, I am not looking for any lightening or whitening). The only thing missing is that it is not water resistant... But I guess one can't get it all right? I wish it was though. (But I was on the beach, in and out of water from 4 to 6 pm, and I didn't tan. It could also be because of the timing, I don't know really). 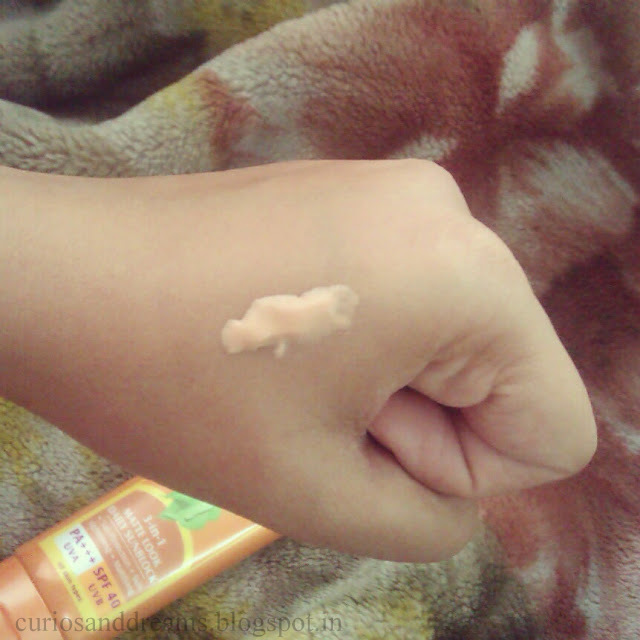 Overall, it is a great sunscreen! I am loving it so far. As a general rule, apply your sunscreen 20 to 30 minutes before you head out. And keep re-applying it every few hours. Stay sun safe!